Along the ceremonial way just over a hundred microphones were in use and temporary control points were established at the main positions. The largest of these was a ninety-foot hut specially constructed on the Colonial Office site and on the day it handled thirty simultaneous broadcasts. 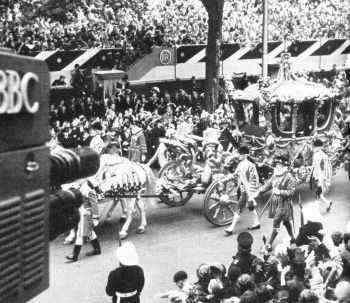 In the broadcasting plan, the ceremonial way itself started with Buckingham Palace, where BBC microphones were installed in a room overlooking the quadrangle. The next broadcasting point, carrying commentators was at the Queen Victoria memorial in front of the Palace. At the end of the Mall through Admiralty Arch, the procession came into Trafalgar Square, the third broadcasting point, where commenatry positions were divided between the King Charles I Statue and a stand at the foot of Nelson's Column. Sound and TV units were installed near the point where the railway crosses the Thames by Hungerford Bridge. It was here, on the Victoria Embankment that places were reserved for 30,000 London schoolchildren to watch the proceedings. Next, on to Westminster, Big Ben and the Houses of Parliament and thence to Westminster Abbey, where the main sound broadcasting positions were on the Colonial Office Site and the Middlesex Guildhall stand. In addition one other point was installed in the Annexe built at the West Door of the Abbey. From here Audrey Russell and Captain Briggs of Canadian Broadcasting Corporation described for listeners the scene in the hall and the Great Proceeding into the Abbey. On the five-and-a-half mile return route through the West End of London to Buckingham Palace, the commentary was taken up after Trafalgar Square, at a point in the vicinity of St. James's Palace, looking along the Mall and up St. James's Street to Piccadilly, Then by way of Piccadilly and the Duke of Wellington's House, 'No. 1 London', the procession turned into Hyde Park. At Stanhope Gate in the East Carriage Road overlooking Park Lane yet another broadcasting point was established. Two final poistions for microphones were near Marble Arch at the junction of Park Lane and at Piccadilly Circus. From Piccadilly Circus the route went down Haymarket, entered Trafalgar Square, for the third time, and passed under Admiralty Arch and back down the Mall to the Palace. John Snagge, 'The Voice of the Boat Race' with twenty-eight years' service at the microphone, was in the Abbey. Audrey Russell, 'first lady' of BBC commentators, was another specialist in describing Royal occasions. With Captain Briggs she broadcst ed from the Annexe. Frank Gillard, a West countryman from Somerset, Head of the BBC's West Regional programmes, was an old hand at describing Royal occasions. Wynford Vaughan Thomas gave his first running commentary in London at the previous Coronation - in Welsh. This time he broadcast from the Queen Victoria Memorial. 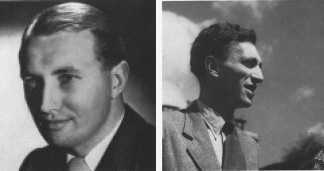 Captain W. E. S. Briggs, R.C.N., was the Canandian representative in the team with a background of the Navy, advertising, and broadcasting. He broadcast from the Annexe. Howard Marshall, Commentator inside the Abbey for the Coronation in 1937 was there again in 1952. Willy Richardson hailed from Trinidad and was the West Indies representative in the team, broadcasting from the Queen Victoria Memorial. John Arlott, of cricketing fame, was player, historian, writer and commentator. He described the scene at Piccadilly Circus as the procession reached the Haymarket. Talbot Duckmanton, the Australian representative in the team. One of A.B.C. 's foremost commentators and, in his early thirties, its youngest executive officer. Raymond Baxter made a name for himself as a commentator on mechanical subjects, especially aeroplanes and motor cars. Coronation Day found him in Trafalgar Square. Rex Alston, one of the foremost sporting commentators, specialising in rugby and cricket. He described the scene on the Victoria Embankment. Jean Metcalfe, the well known Light Programme announcer, broadcast the start of the procession from a room overlooking the quadrangle at Buckingham Palace. Henry Riddell had long experience at the microphone, covering many events in pageantry. On the day he described the scene in St. James's Street. Tom Fleming was Scotland's representative in the team. Edinburgh-born, a writer and actor, he described the scene outside the Abbey. 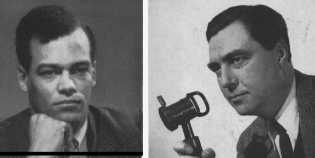 David Lloyd James joined the BBC an an announcer in 1937 and was an authority on broadcast English. Alun Williams began broadcasting in 1940 as actor, singer, and pianist. A well-known commentator in Wales, he came to London to join the Coronation team.